I am sick of two things, being sick and coughing all day long, and weeding. Weeds grow faster than anything I know. One that puts out what looks like pretty, small white flower heads from a distance is a real bugaboo. It blooms all summer long and crops up everywhere from my yard, to roadsides, pastures, hay fields, and piles of soil. After some looking, I found it is an invasive plant coming from Eurasia with the common name hoary alyssum, and the botanical moniker of Berteroa incana L. Alyssum? Yep. It is from the Brassicaceae or mustard family, and so is the garden plant alyssum! News to me; I’d much rather have the garden plant. It is also known as hoary madwort, hoary berteroa, and hoary Alison. I’ve never heard of any of these names before, but I’ve recognized the weed for decades — thought is was a wild flower as a child. The ‘hoary’ comes in because it has small hairs covering the stems and leaves that you can see under a magnifying glass. You can feel this from the rough, slightly tacky texture of the stem and leaves. Anyhow, I am pulling this out all the time, but more plants grow as fast as I pull them. They are a pain to pull because they have a taproot and to get it all out you have to gather up all the long stems and pull. It is interesting how many persistent weeds have taproots. I pulled my back out reaching down and pulling out a black medic one time. Ouch! Limped around for weeks. Was that revenge of the weeds? Hoary alyssum thrives in cold winters, hot summers, dry conditions, and poor soils. Guess what I have? 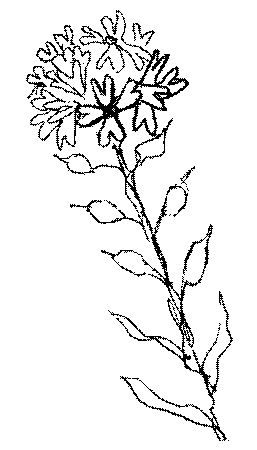 It starts out as a rosette of leaves, and then the flowering stems emerge. Because it sets seed quickly and several generations can be produced in one season, it is considered an annual. Plants that have bloomed will not survive the winter, but the rosette form will, setting seed the next spring, making it a biannual. Small flies, bees, and wasps fertilize the flowers. I discovered hoary alyssum sets thousands of seeds and thrives in disturbed and poor soils. The dropped seeds can remain in the soil for many years, so whenever the soil is disturbed, the seeds, which need light and moisture to grow, will emerge as plants. I figure my soil is well seeded for the future. If you own horses, beware. 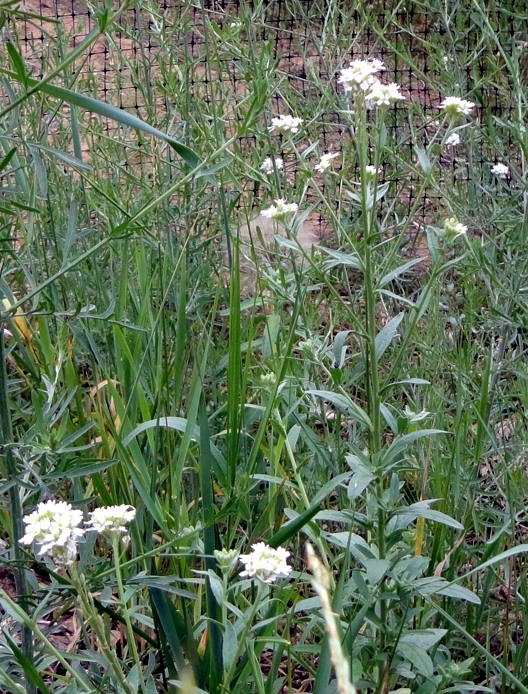 Hoary alyssum is considered toxic and can cause problems if found in pastures or feed. Much of this information was taken from a Montana State University sheet.